One of the most iconic symbols in America has to be the Golden Gate Bridge in San Francisco. Spanning across the Golden Gate of San Francisco bay and joining US Route 101 and the California State Route 1; this is possibly one of the most photographed bridges in the world. Completed under budget in April 1937, it was at the time the longest cable suspension bridge in the world. The original design by Joseph Strauss was deemed unacceptable from a visual point, with the final design by New York’s Manhattan Bridge designer Leon Moisseiff. With so many vantage points to view the bridge and pedestrian access by foot or bicycle, you will be sure to snap perfect pictures. She is particularly beautiful when clouded in fog. 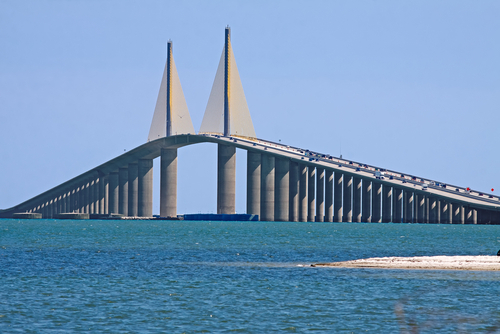 The Bob Graham Skyway Bridge spans almost 7kms (4 miles) over Tampa Bay in Florida and connects St. Petersburg and Terra Ceia. Completed in February 1987 it was built as a replacement from an older version that was partially destroyed in a shipping accident. The Sunshine Skyway Bridge is often featured in automobile commercials, which due to its length and sunny location makes it ideal for filming. At the highest point she stands 431 feet high (131m) and approximately 175 feet from the water (53m) due to the popular shipping and cruise ship laneway. 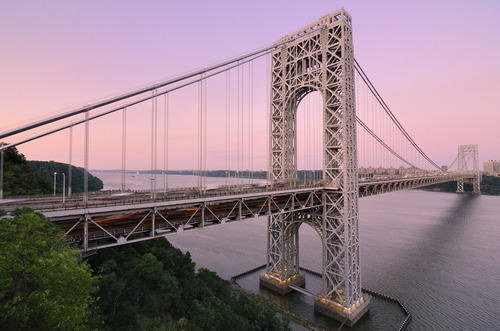 Dubbed the GWB by locals, the George Washington Bridge sprawls 4,760 feet (1,450m) across the Hudson River and joins Manhattan with New Jersey. This is one unique bridge that is spread over two different levels with the upper level providing 4 lanes of traffic in each direction and the lower level with 3 lanes of traffic in each direction to make a total of 14 lanes. Originally built in October 1931 and designed by Cass Gilbert and named the Hudson River Bridge, the name was changed soon after and dedicated to the first President of the United States, George Washington. Popular as a pedestrian and tourist photo vantage point, a dedicated pass is allocated allowing you to walk, cycle or roller skate end to end. 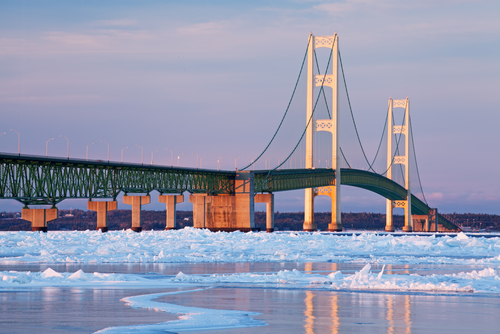 Envisioned as early as the 1880’s but not completed until 1957, Mackinac Bridge, or “Big Mac”, joins the upper and lower peninsulas of Michigan and is currently the third longest suspension bridge in the world. Stretched over 26,000 feet (8,000m) and 155 feet high (47m), the four lanes provide direct access to approximately 12,000 movements per day. Designed by engineer David B Steinman, it was named after the Algonquian Native Americans name for the area ‘Michilimackinac’ meaning “great road of departure”. There is no pedestrian or bicycle access across the bridge due to the reasonably low guard railing and high gusts of wind. Nervous drivers can have their transportation driven for them across the bridge for free using the Drivers Assistance Program. 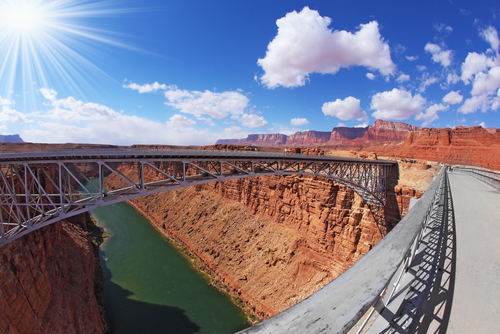 Located in Marble Canyon Arizona, the Navajo Bridge has two bridges spanning 900 feet over and 470 feet above the Colorado River. The original bridge (on left of image) was built in 1929 but by 1990 the traffic flow was deemed too great and the bridge failed many Highway Codes. Due to several factors such as local interests and environmental concerns, replacement soon became the only option. Once completed in 1994 the original bridge was closed down to traffic and is now pedestrian access only with the new bridge, adhering to all Highway Codes, becoming the vehicle access. Great photo opportunities await with wonderful views of a small part of the Colorado River. Read more from Destinations, Top 5..., Travel Tips, U.S.A. This is one of the best websites that I’ve ever visited. I’ll subsribe to your website!